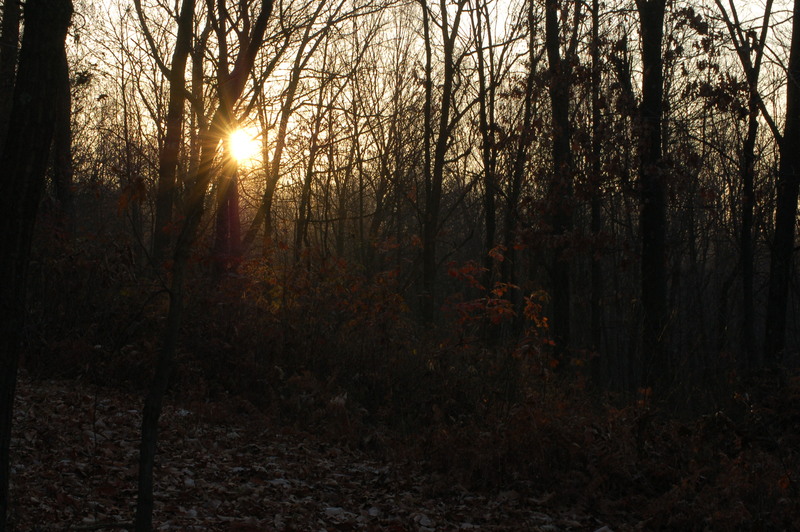 I went out into the woods to spend some time hunting with Bob. I, however, was hunting with a camera. Bob was hoping to see a buck. 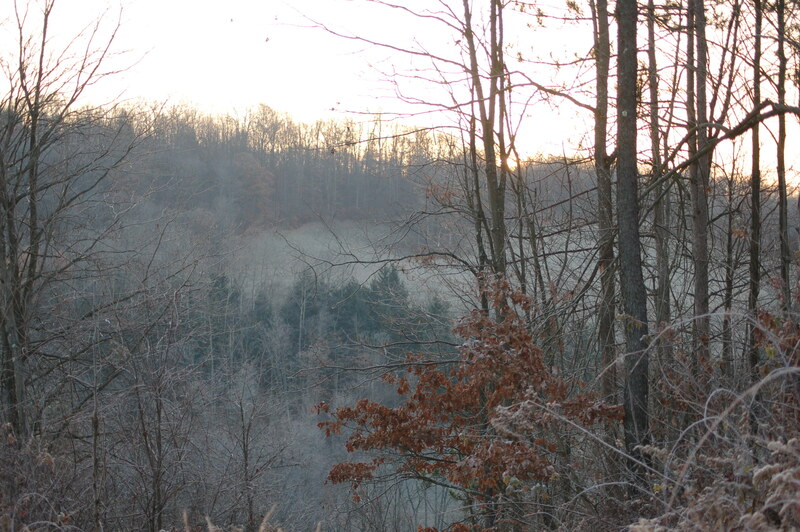 The frost was a hard frost as we ascended a gas line to hunt the area where I bagged the buck on the first day. If one would step on exposed soil the loud crack of frost permeated ground could be heard for quite a distance. the walk needed to stay on the grassy and leaf-covered ares of the gas line. 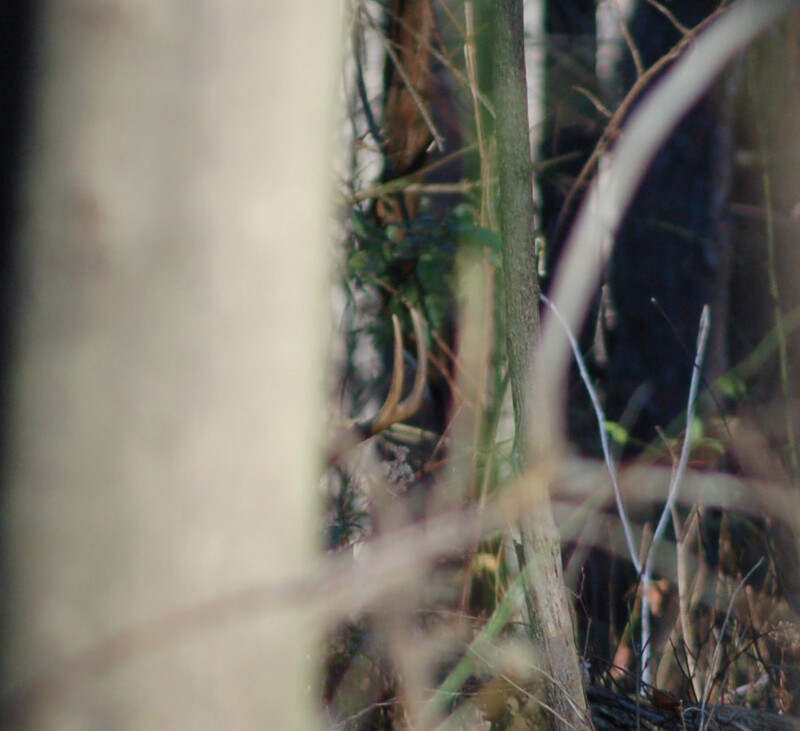 The day was turning into a beautiful calm and sunny day as the hunt began. I situated Bob and a likely spot. Here he could see around and watch birds and squirrels as these critters filled the time. I began walking about in hopes of moving some deer around. On one of these jaunts, memories were flooding back on past days afield. I was remembering a situation whereas the landowners grandson had harvested a buck at this site. I turned to look right and the orange colors shouted from a tree! There was Jon! We spent about 15 minutes talking and teasing before we went our separate ways. I had seen a couple of deer and Bob saw about five. 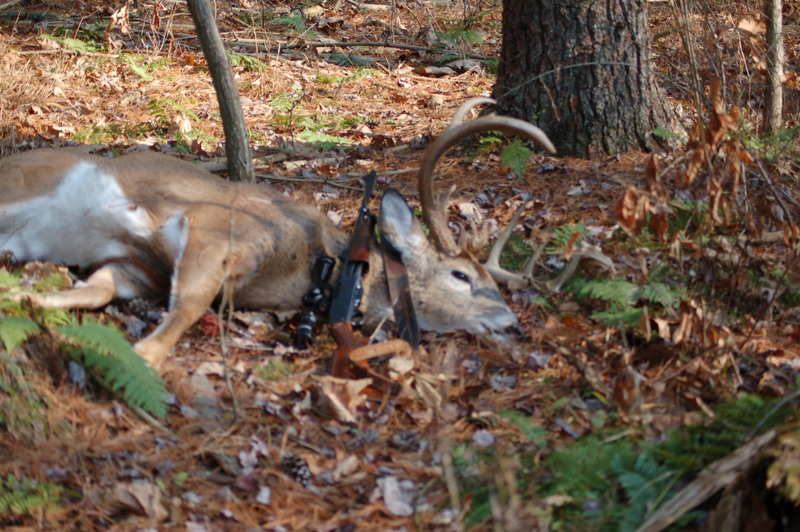 One was a half-rack buck. 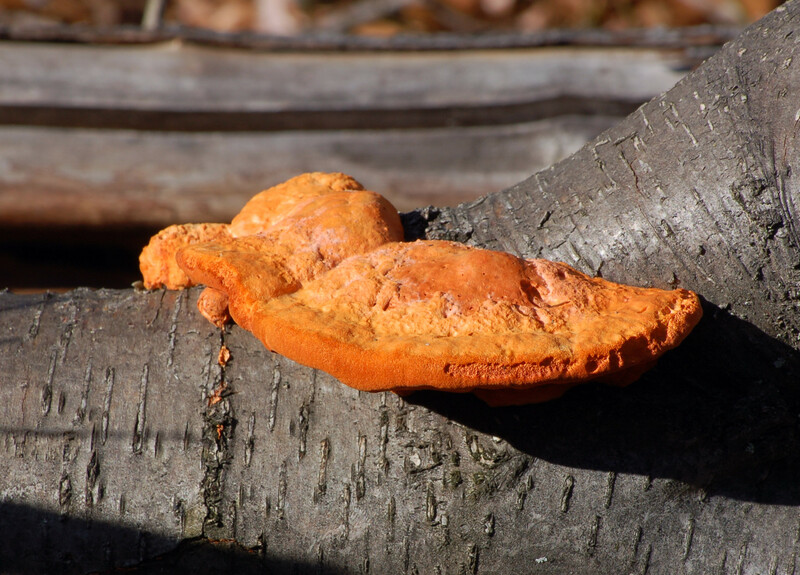 I am sure this was one of those I had been seeing off and on all fall. I always enjoy time in the woods. We quit hunting prior to noon enjoying some sloppy-joe sandwiches my mother had made. A tradition of mine in regards to deer hunting is to return all left over parts back to nature. Another tradition is to hang a rib cage in a tree at my residence. Although, many might think this as being weird or disgusting I find a sense of satisfaction in doing so. 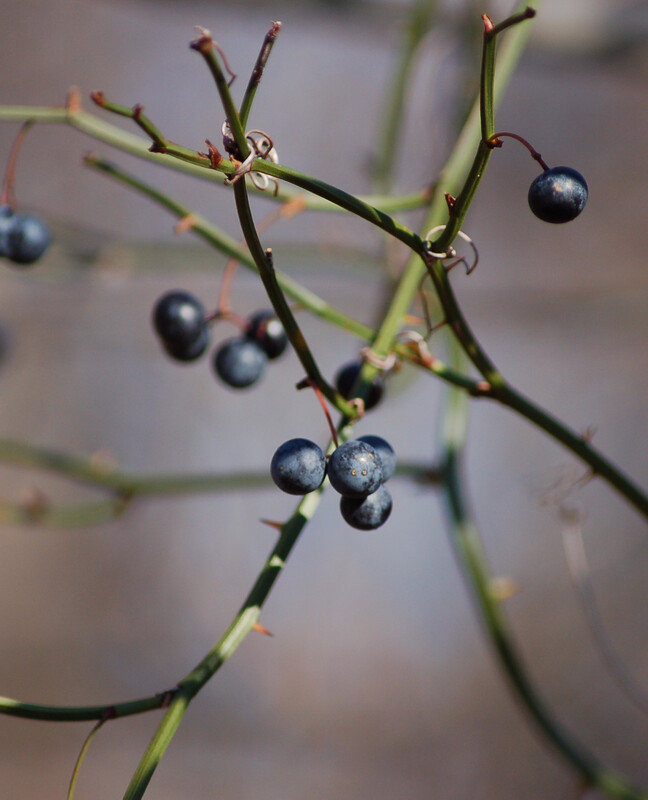 Many small birds as the winter strengthens in cold and snow find calorie-producing food from this act. Crows enjoy feasting. 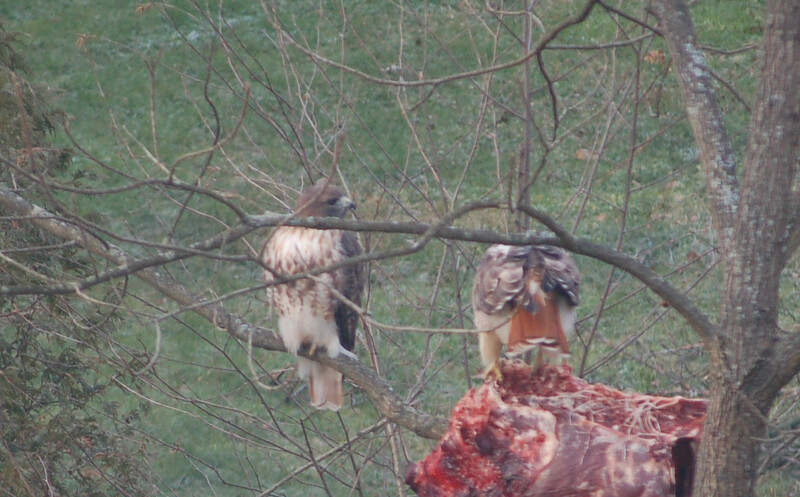 An added treat for me are the constant red-tailed hawks that enjoy the easily obtainable food source. An added bonus is that some rabbit or bird will enjoy more time as a living creature rather than a food supply. 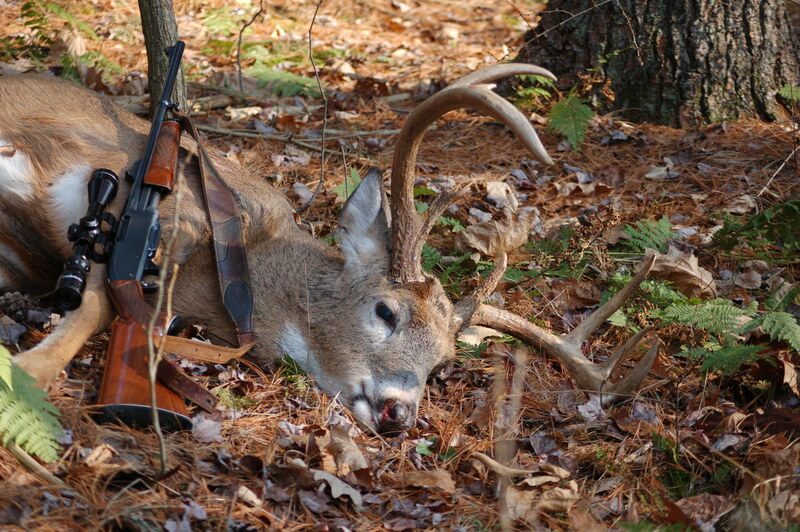 The annual Pennsylvania Buck Season began today. I wasn’t feeling all that excited about hunting this morning. I was more thrilled with the prospect of getting some decent wildlife photos. There are a number of reasons of my lack of enthusiasm. One reason is the fact my freezer is full of red stag meat! Regardless, I arrived in the area where I traditionally hunt deer later than normal for me. I had walked about 500 feet when the 2012 season opener legal time arrived. I watched a turkey explode from a tree and fly across Cherry Run onto the opposite hillside. I reached the next level of the hill and crept slowly until I situated myself at the point where two logs crossed each other. 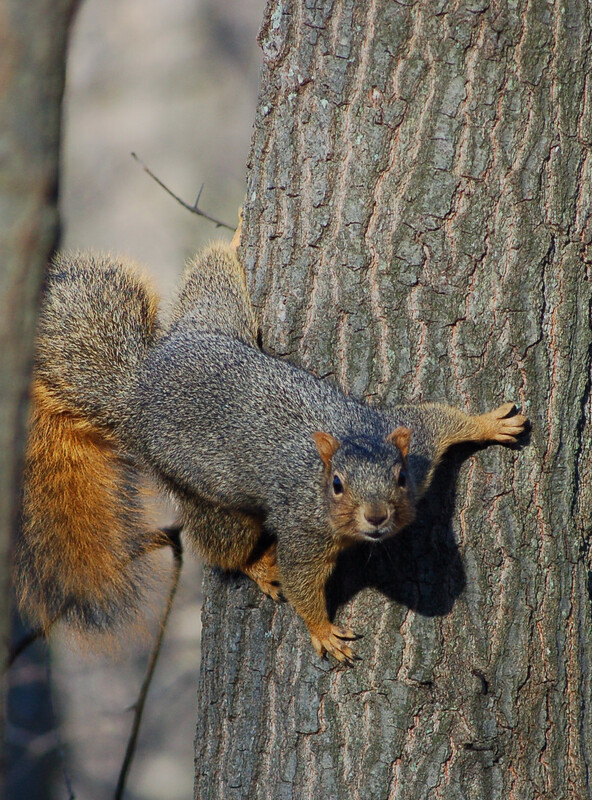 I was watching a couple of squirrels when I saw a glint of lighter color among the gray and dark colors of the young tree growth. Soon a buck appeared. I saw 4 points and, possibly another along the main beam. The point was either broken off or just hadn’t grown out very long. 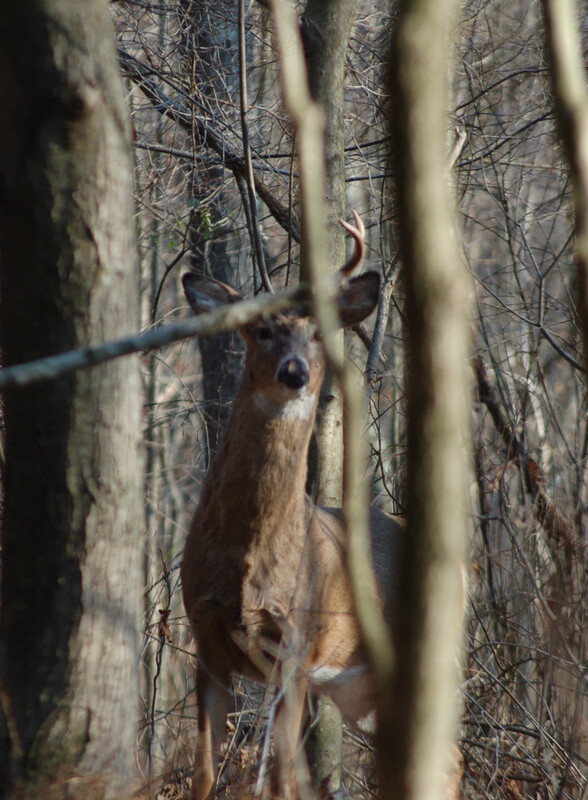 I reached for my camera as the buck closed in to about 18 feet. He became suspicious as I held the camera low not being able to bring it to my eye. I was had! 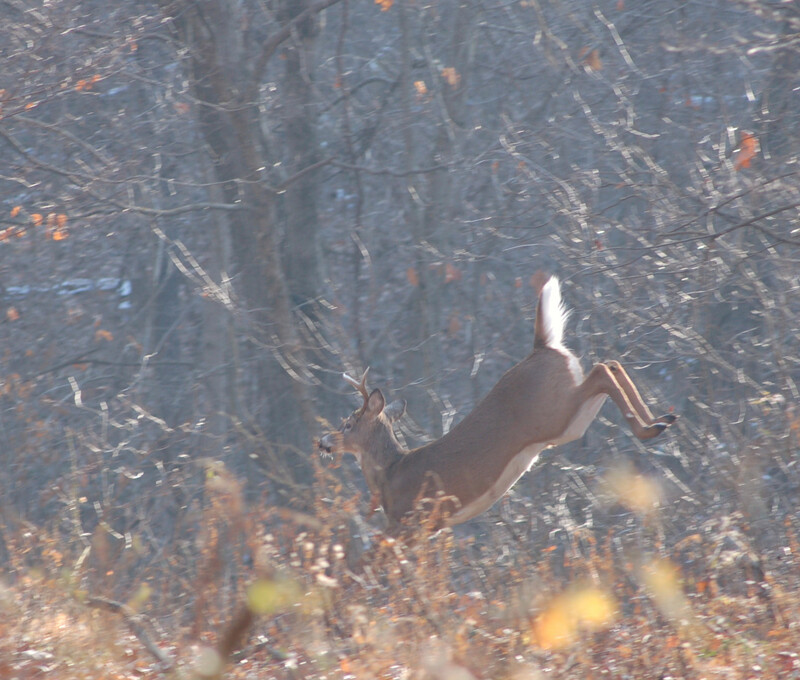 The buck exited the scene! Inactivity brought about some shivers and I decided to sneak around a bit and settle in at some sunny area. The bird life was everywhere! 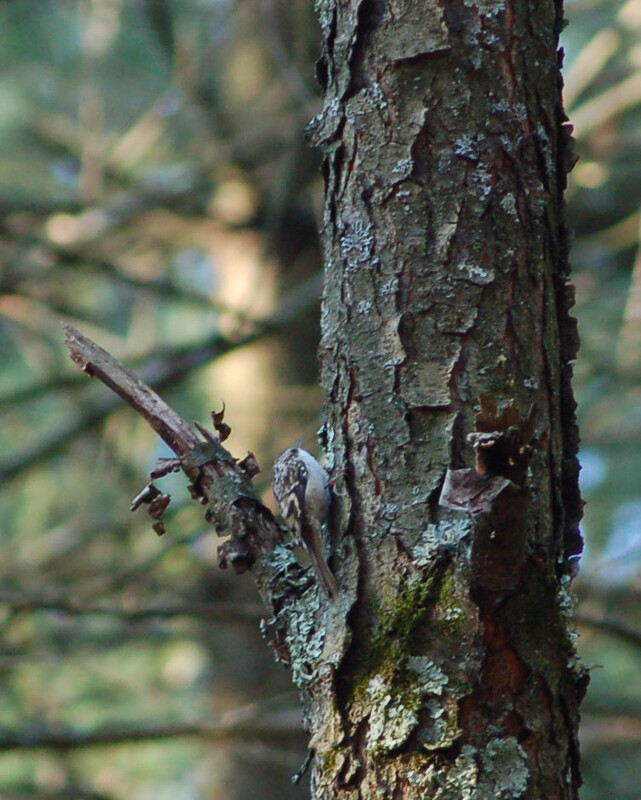 I was watching red-breasted nuthatches; both the Downy and Hairy woodpeckers; chickadees; golden-crowned kinglets and a couple of brown creepers. Believe me trying to get great photos of darting birds is difficult. Most failed! I heard some leaf rustling across the little hollow and soon four deer began sneaking through the pines. They were all doe. I managed a few photos, but there was nothing outstanding with the shots. I heard leaf rustling behind me and as I slowly turned there were three does in a sunny area and closing in. I couldn’t move the camera into position for fear of scaring them. 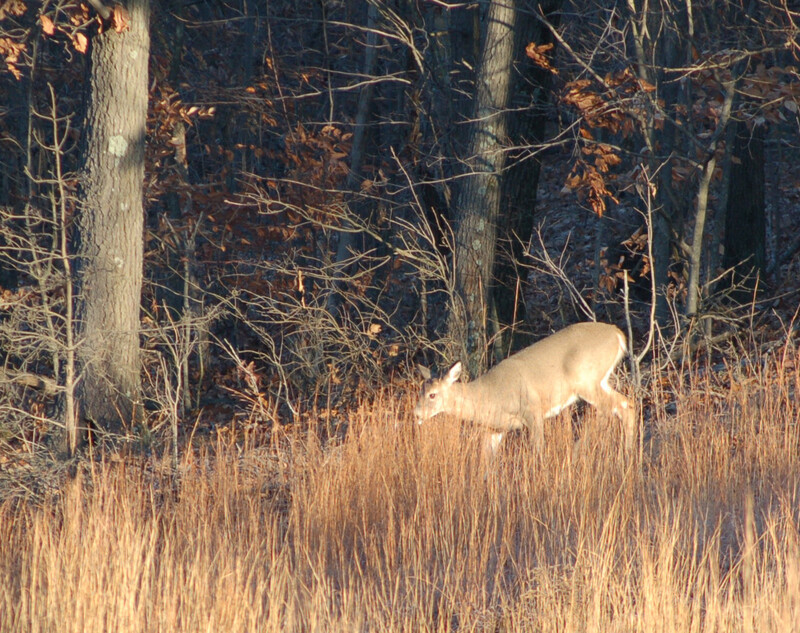 Another doe was following them and soon two half-rack bucks appeared. 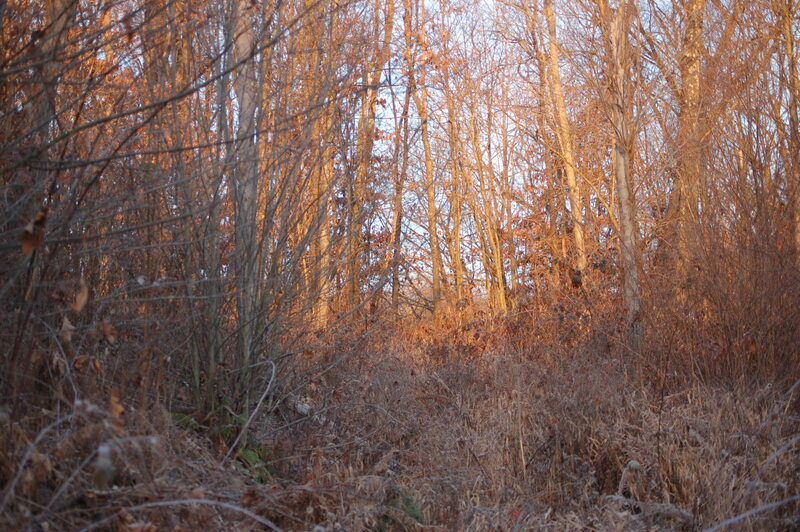 I began hearing some turkeys across the hollow and soon saw another four deer through the brush. I couldn’t identify any. The ten o’clock hour was closing in and I was having a blast seeing all these deer and birds and squirrels. I heard some activity across the hollow again and soon saw another buck, followed by a second, followed by a nice buck, followed by another nice buck. Four bucks! They were about 100 yards away but moving slightly diagonally towards me. The dense pine limbs made for difficulty counting points. 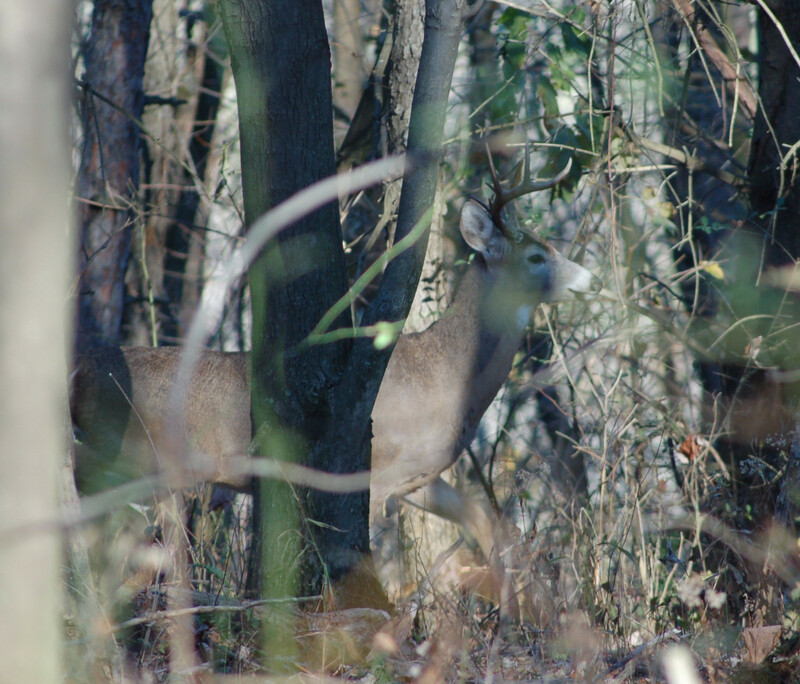 Eventually the one big buck allowed his front shoulder to be exposed in an opening in the woods. The 80 yard shot hit true! I was up and was almost run over by two of the other bucks! The one I shot cut diagonally in front of me again but in the other direction. I watched the big deer crash. He went about 35 yards before collapsing. The time was 10:05. The widest measurement on the antlers is 21 3/4 inches. There are 10 points. I called my step father, at home, and later my cousin, Donnie to help load the deer. I had the buck skinned and quartered by 1:30. The Wheatfield…On Stone Means Road Trip! Slim is a member and current president of the living history Civil War group representing the Company D 62nd Pennsylvania Volunteer Infantry 5th Corps. www.62ndpvi.wordpress.com I am honored to be an honorary member. This group does living history programs concerning the 62nd PVI. Activities include parades; grave dedications and programs to educate others about the 62nd PVI during the Civil War. the respect this group has for the past and those brave men is outstanding! take some time to study up on the group from the web site shown above. Many members of the original 62nd PVI came from my area of Armstrong County. The final stop on this road trip would be near to a community known as Austin, Pennsylvania. Here we would be stopping at a home built in 1883 currently known as the First Fork Lodge. 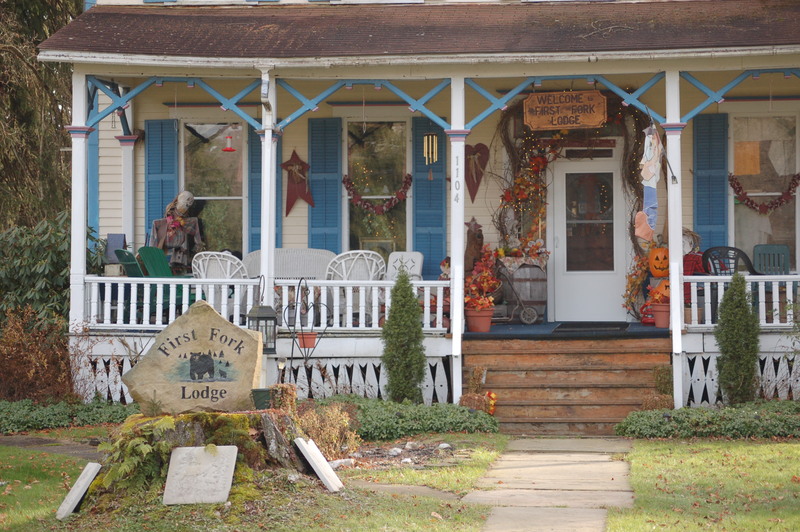 They owners, Jack and Linda Krafft supply lodging to hunters and fishermen/ women. The building, also, has a Fly Shop; Sporting Goods and the beauty of art on flagstones. Their web site is: www.firstforklodge.com The other web site in regards to their art on stone products is: www.framingonstone.com If interested in any art on stone products don’t hesitate to contact Jack and Linda! The owners have had success with prints from; “THE WHEATFIELD-WHIRLPOOL OF DEATH.”Readers of my blog will recognize this title from past blogs, such as from the July 6 and August 25 sites from 2011. These prints have been anchored to quarried flagstones and sealed. This, of course, allows for the stone texture to show through giving a different dimension to each print. 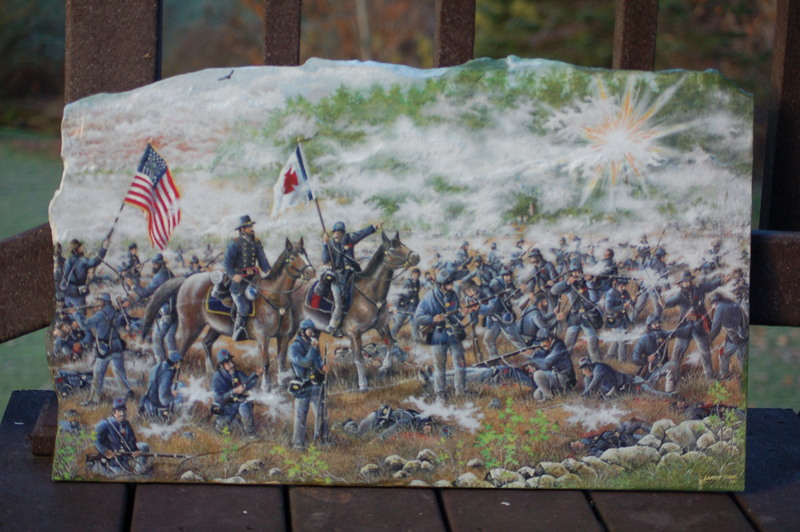 Our mission was to pick up five of these stones for use for the 62nd PVI group. Jack, gave us a mini tour of the lower floor of the building. The rooms are chocked -full of art; antiques and hunting and fishing related things. NO TV! The owners encourage those staying to enjoy a sitting room to talk and become acquainted. This is a nice touch in the hurry-up world of today. 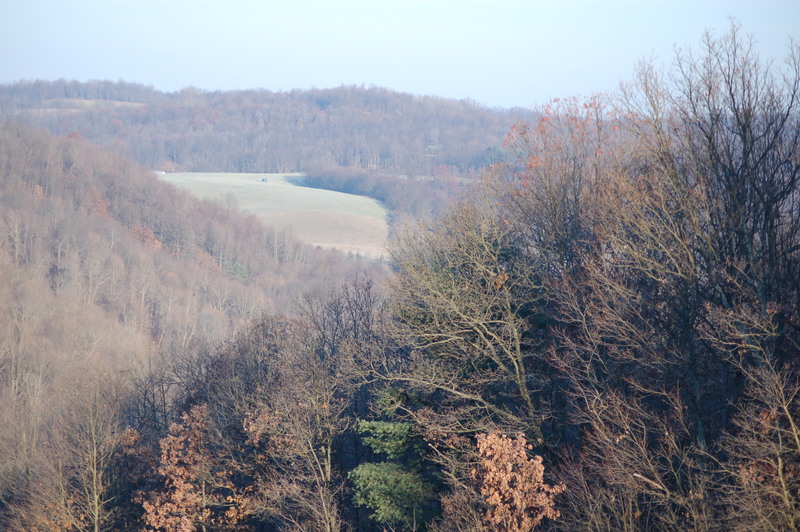 Our travels included returning via Route 872 south through the mountain region of Potter; Elk and Cameron Counties. This is such a beautiful area. We, also came through elk country. We saw over thirty elk and a number of deer. I spotted a large-racked buck that appeared to be tangled in a fence. We turned around and the buck was gone! We saw one grouse crossing the road and was blessed to see an eagle perched high in a sycamore tree. Due to timing restraints our photo opportunities were scarce. I exited my vehicle with a plan to enter into the woods of a mile long hollow and “still hunt” for bear. (Still-hunting is the style of hunting of moving along slowly and stopping to look and listen.) This hollow is very wide and has brushy areas; hemlocks and rhododendron thickets. As I was walking towards the woods, three sets of vehicle lights could be viewed and turned into the site. An organized bear drive was being planned for daylight. I turned around and drove two miles north and went on an exploratory hunt. 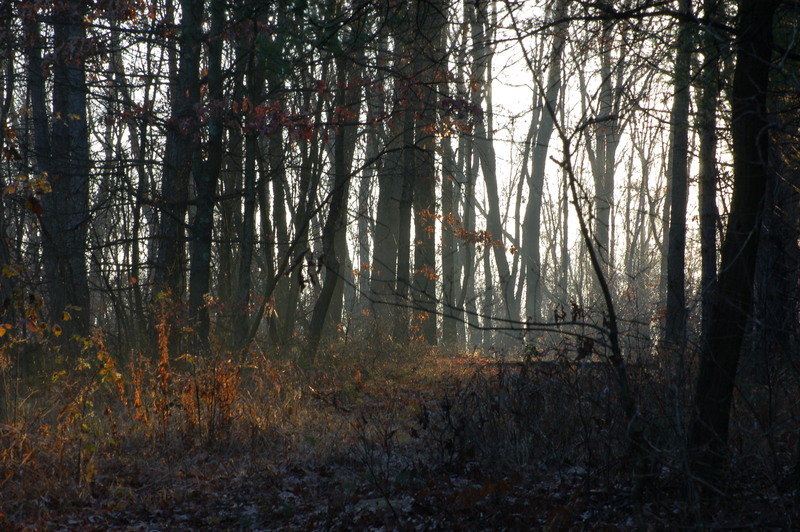 I was in a new area in the 287 State Game Lands. 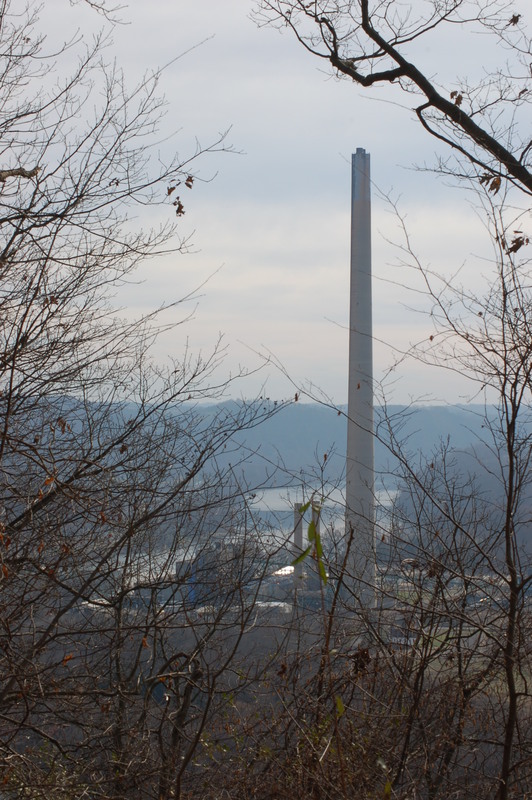 The area I was exploring proved to be a site of many old strip mining high walls. I estimated this area was mined early into the last century if not before. The high walls have plenty of spruce, larch (Tamarack) trees, poplar and aspens. I wondered why individuals left the areas this way in the past. I wondered even more why landowners seemed to allow it! At one point I could barely hear the shouts of the drivers from the earlier mentioned drive for bear. They were so far I first thought I was hearing swans high into the sky. (I saw swans flying. 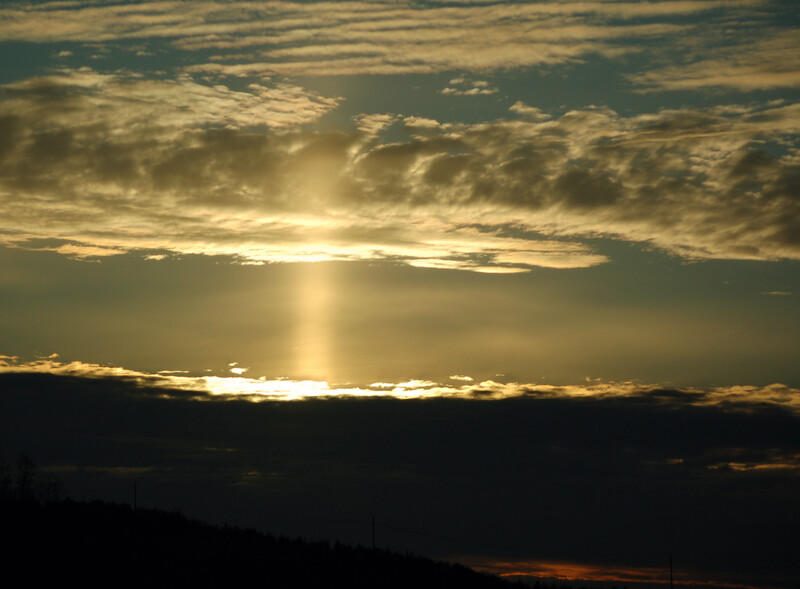 They appeared silver as the sun illuminated their white plumage.) The drive produced no shots! I heard two far off shots all day. I am suspecting the bear may be in the standing corn. There are many acres of corn in this area. I saw some deer and squirrels. One deer had a very small set of antlers. 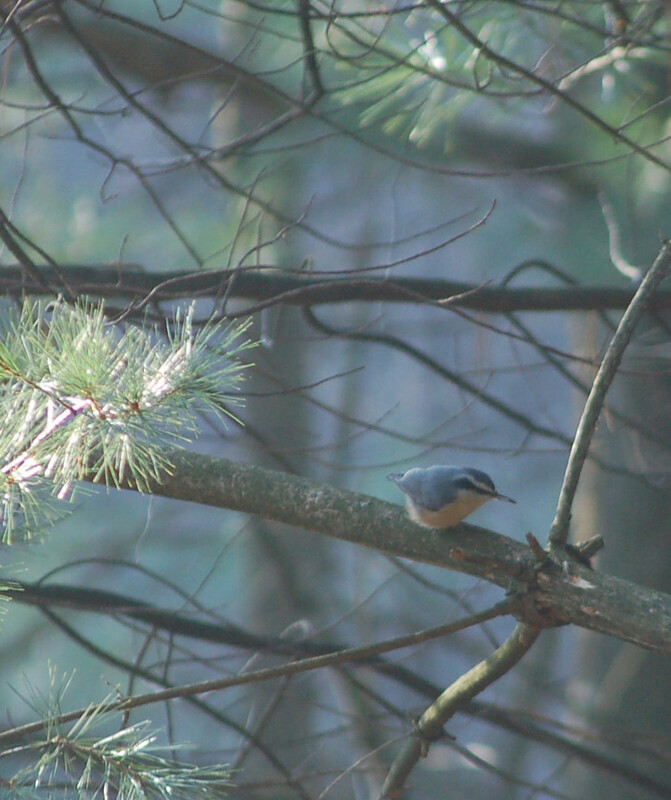 I found joy with seeing many small birds too. 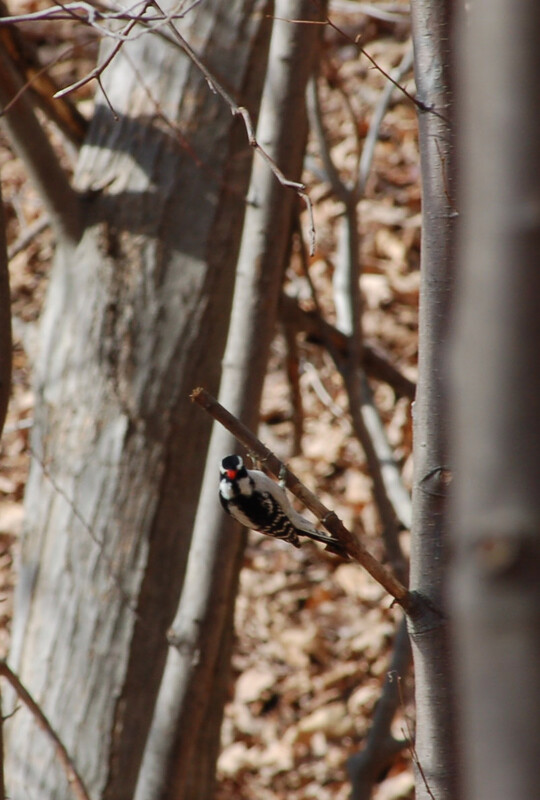 Birds such as the golden-crowned kinglet; downy woodpeckers, doves and jays were viewed. Long way to the river! Noon was approaching as my circling proved to be within reach of the car. I decided to go back to where I was parked originally and walk back over to the river hill site I hunted last year on the first day. 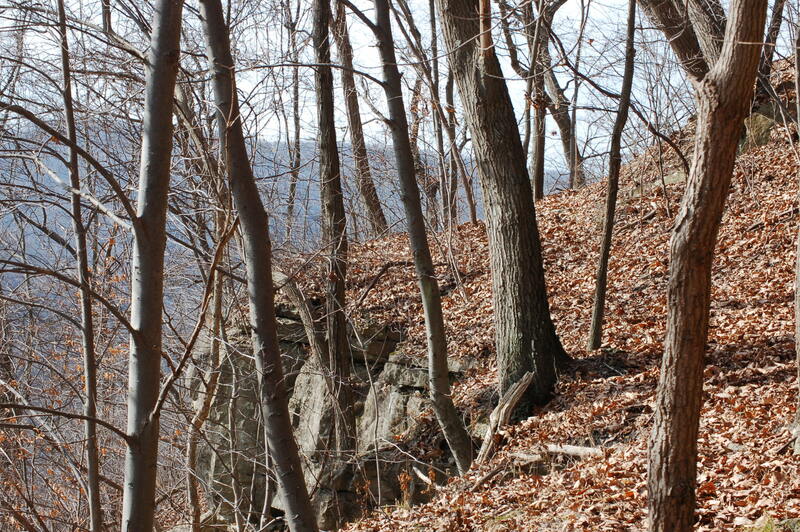 This hill overlooks the mighty Allegheny River and is very steep. As I walked along about 1/3 of the way down over, I found the trail to be only as wide as the deer trail I was on. 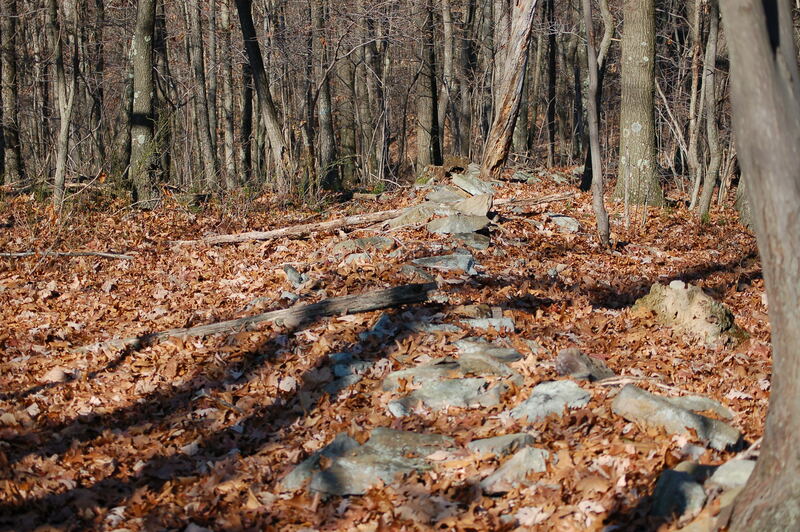 Occasionally, I could see remnants of old mining or logging roads from ancient of times. I wondered how far I would go if I stumbled??? Prior to reaching the river hill, I met a father and two teenage offspring. We enjoyed some great conversation before shaking hands and wandering away. Great to see his daughter and son learning about the great outdoors! At two different times I set down and did a little reading. The warm temperatures made climbing hills a little exhausting so a half hour rest was welcomed on two occasions. The book I am reading is “COMMON SENSE” by Thomas Paine. The book was originally written in 1776 during the time of the breaking down of relations with Great Britain and the colonies. The man would not be surprised at what has happened in America today. He had it pegged! On this hunt I saw a small, illegal buck and doe. I heard them long before I saw them. The two were coming along the steep hillsides. They managed to get along much better than I! I reached the vehicle around 3:15 and decided to begin the drive home. Laurie still has a lot of homemade buns around the house! 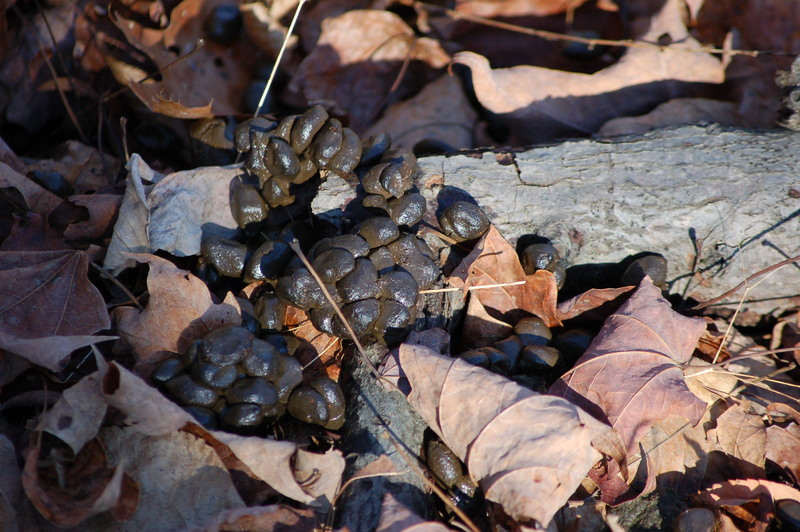 A very spring-like morning was to be for Pennsylvania’s first day of the black bear season. The temperatures as I began my jaunt up the hill hovered around 25 degrees. A heavy frost covered all vegetation. However, as soon as the sun peeked out from the eastern horizon the temperatures warmed rather quickly. 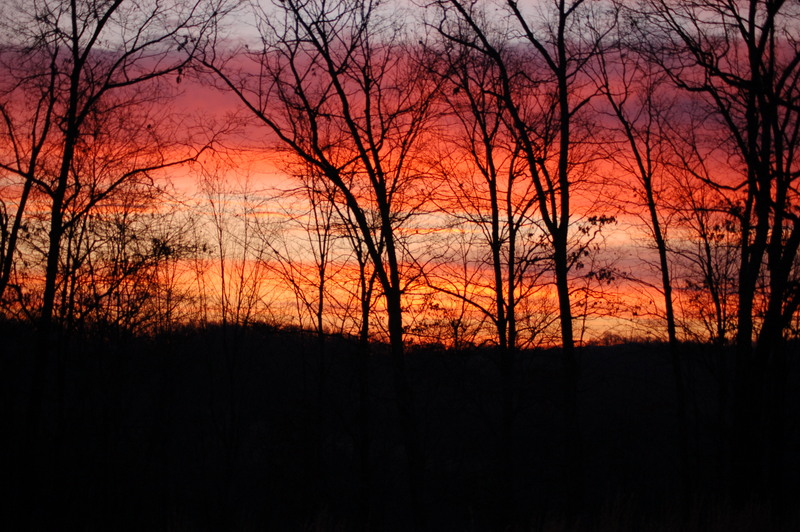 The red and orange colors permeated the trees as the sun’s rays touched each limb and leaf. My Remington 760 in a 30:06 caliber had been hinting for a walk for a couple of weeks now. This would be the day ! The plan for this first morning was simple. I was going to Cherry Run to familiar haunts and sneak around searching for a bear. I did not do any pre-season scouting, but I wanted to visit certain sites. The reason for this is simple too. 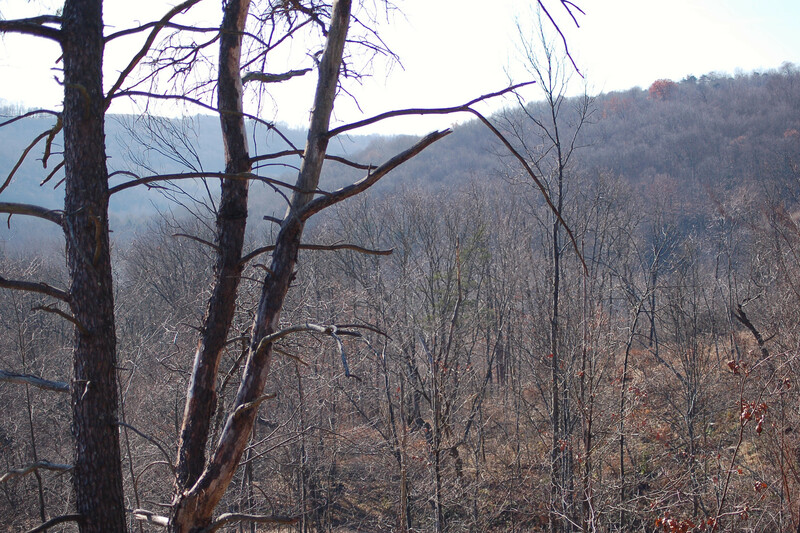 Some of the steep slopes had been heavily timbered allowing for great bear habitat, but the main reason was to hunt this site before it becomes mined. 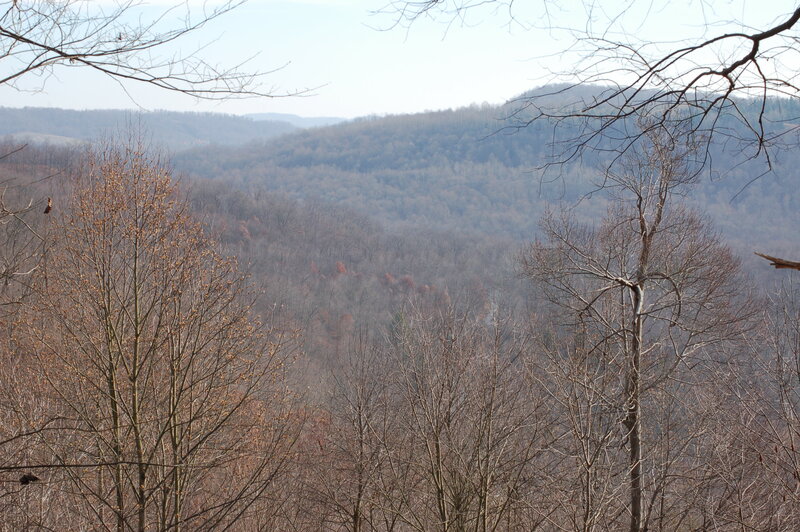 The hills and hollows of this area are every bit as steep as those found in Potter County. The only difference is the elevation above sea level. They are not as high. Bear do travel in this area at times. My cousin saw three last August crossing a right-of-way line. The hunt today failed to yield any bear or bear sign, but I had hopes. A corn field on the top had been harvested. These facts didn’t matter to me for I just wanted to spend some quality woods time in areas I love. I would be searching for old memories too. A bear sighting would have been a plus although I knew my odds were very low. I heard some turkey roost talk as I edged uphill. Later on my return through the area I would walk into a flock of 8-10 birds. 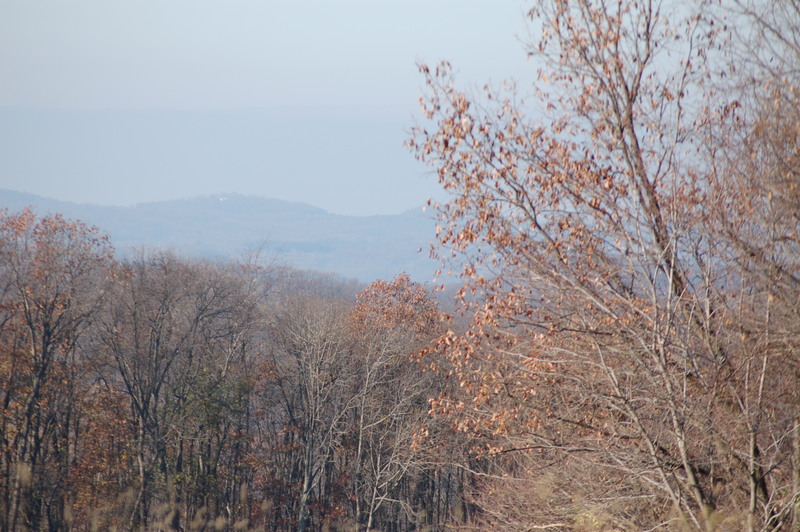 I wondered if my step-father, Bob could climb these hills for the rest of the turkey season later next week. My walking would spend approximately 5.5 hours on this hill and through the hollows. I saw many deer including one buck. I watched one grouse fly far ahead of me flying along the horizon line. 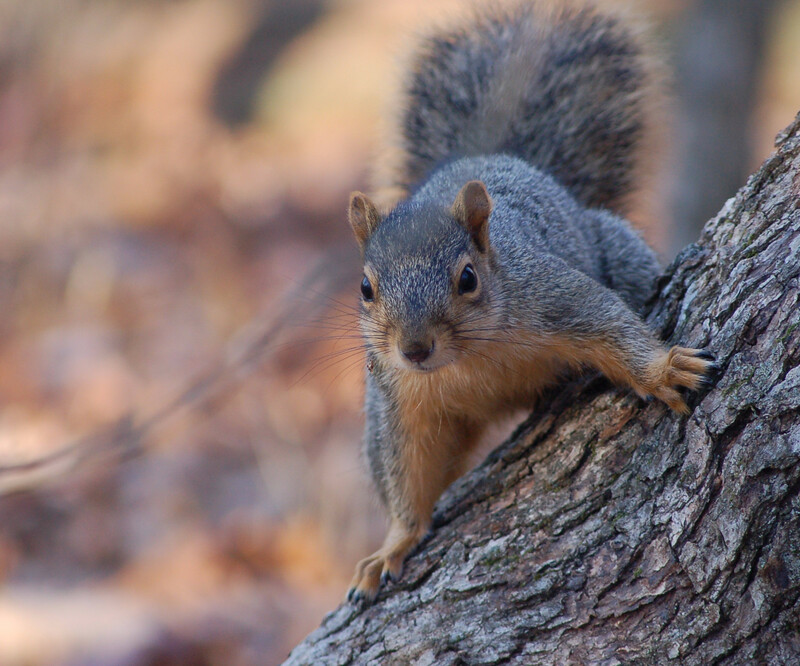 Other critters were a number of fox squirrels and a few gray squirrels. 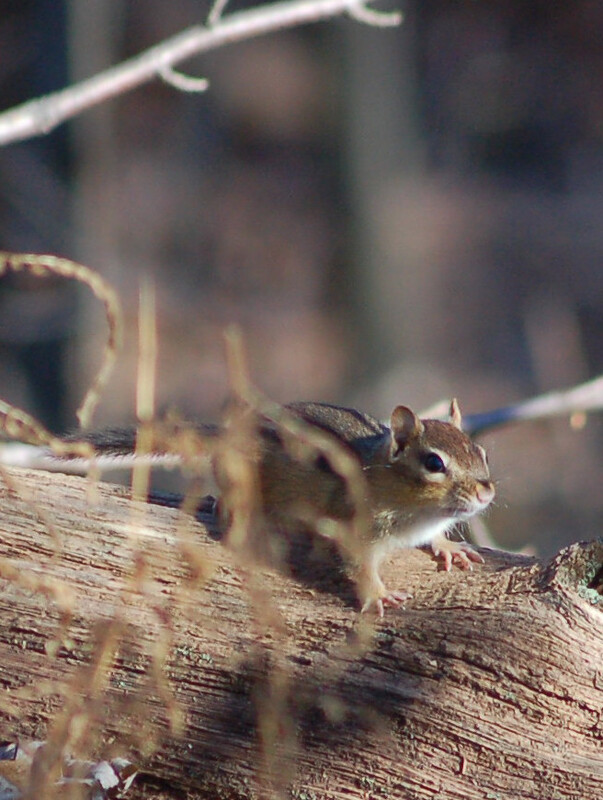 I saw a few chipmunks out and about because of the nice weather. I found myself become rather warm and by 10:30 I removed a sweat shirt. 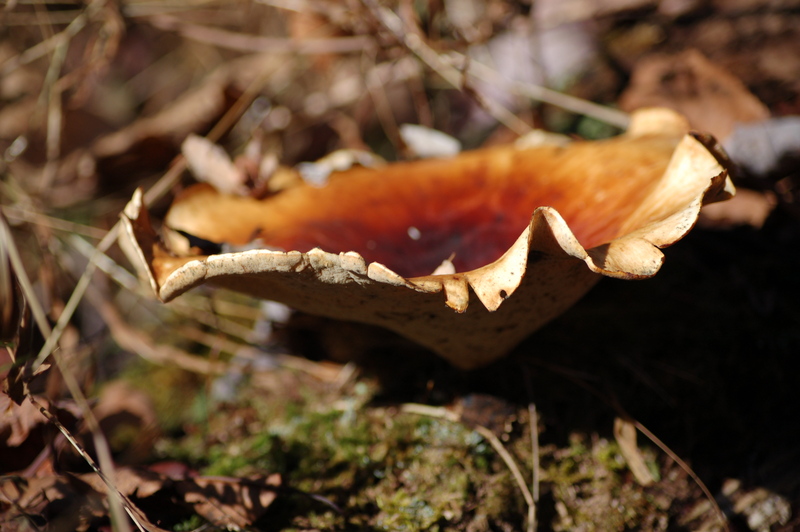 The temperatures were climbing and the clear, cloudless skies allowed for the sun to dry out the woodland floor rapidly. However, whenever I would find myself on the hill where the sun wasn’t filtered in the temps would be noticeably cooler. Eventually, I had cycled around back to the area where I had originally entered the woods. I elected to head to the car and drive about a half of a mile and walk up and over another steep hill to a site I hadn’t been to in many years. I heard a number of shots all afternoon. I decided because of the amount of shooting and the spacings between each shot that most were hunters sighting in their rifles in preparation for the upcoming buck season. I set up and called at a couple of sites. I thought maybe a hungry bear might come to my calling. If nothing else, possibly a coyote might venture in. The plan included a trek around this hill’s top and to travel back towards the car. I would call the hunt off regardless of the time I arrived. The time was around 3:00 when I reached the vehicle. I headed home remembering Laurie was creating home-made buns this day. YUMMY! The lands of my youth! I was able to hunt only a few hours this morning with my step-father, Bob. After a breakfast with my mother the two of us headed to an area to chase turkeys near my homestead. We drove about half-a-mile when I spotted 6-7 turkeys along a field’s edge at the base of a steep pine woodland. I didn’t stop, but continued to drive to the top of the hill as we had planned. 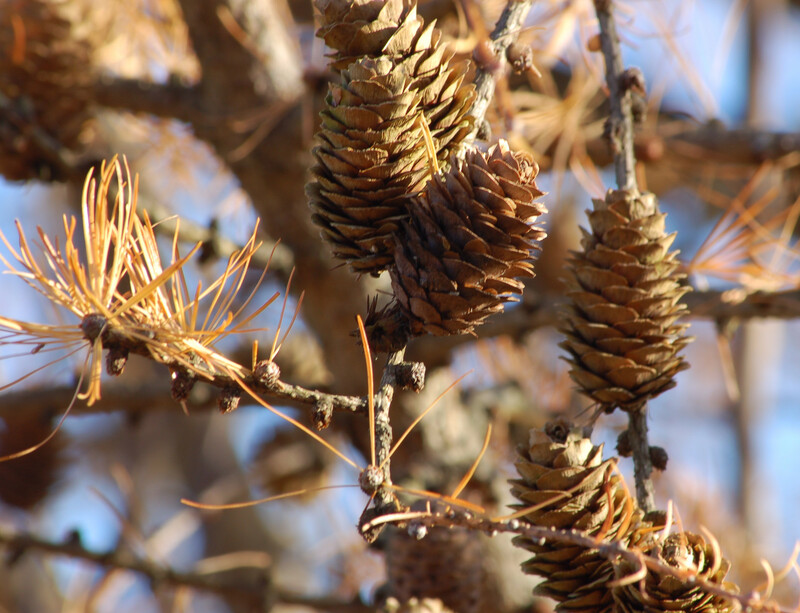 Bob walked along a field on the back-side of the same pines and settled in. My attack plan was to go back the road and circle towards the birds hoping for a break towards Bob’s position. 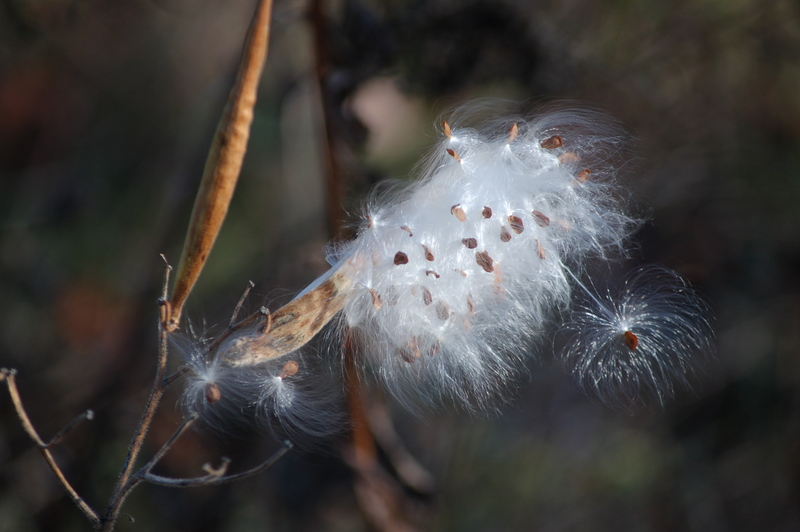 Swamp milkweed seeds waiting for wind. I reached the field and the birds had vanished. I walked to where I had seen them and proceeded through the pines and towards the field where Bob just walked along. As I reached the top two turkeys flew out. Bob saw one! I watched one bird fly across the township road to another hill near Route 422. On no I thought,…noise again! We set up at the site of the flush hoping more birds had been there, but not viewed. 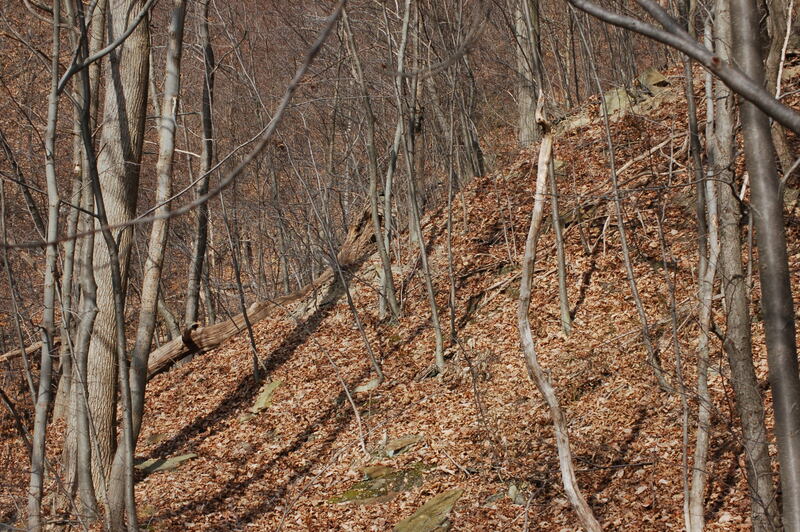 We failed to hear or see any turkeys, however, a buck walked below us and bedded down. I managed a few photos when the surrounding brush allowed for them. Note antler at buck’s bedding site. I located Bob. he saw one or two birds in the brush ahead of him. We set up for an hour and saw nothing. Upon hindsight, I believed the birds he saw were birds of the right-side of the flush. The main flock had went up and over into a field and because of the road noise the birds regrouped out of our hearing range and crossed the road again. 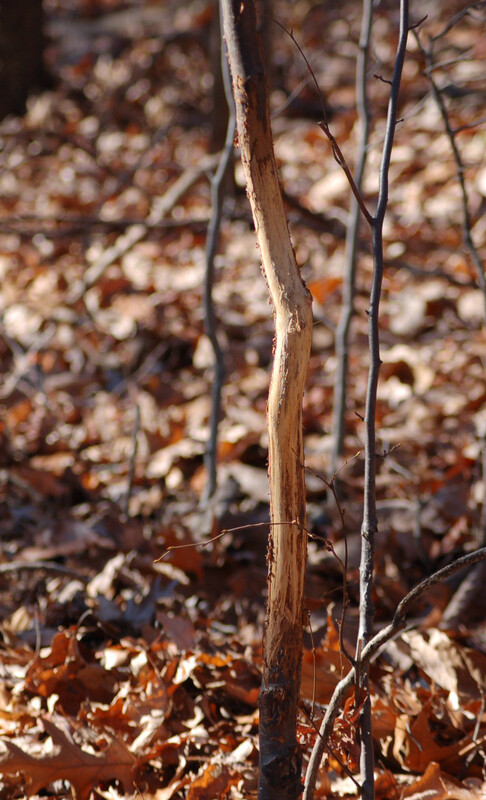 One of many buck rubs! Unfortunately with the time at 12:30, we had to leave. I needed to get home, organized and play music in Kittanning by 3:00. Just below the homestead I saw a flock of turkeys while heading home. Turkeys are like that!